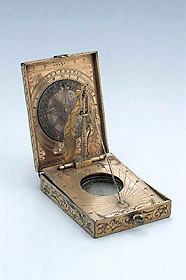 As with similar sundials by the Munich based maker Ulrich Schniep, this instrument carries an engraved image on one of its outer faces. The base of this dial refers to the biblical story of Judith and her beheading of Holophernes. A favourite symbol of liberty and victory over oppression, Schniep shows her in Renaissance dress, wielding a sword and with the head of Holophernes. The principal element of the instrument is an inclining string gnomon sundial adjustable for latitude 42 to 52?. It is accompanied by a compass, a volvelle for converting between Italian and ordinary equal hours, and a table of the latitudes of 38 places.